Stephen Prothero, a Boston University religion scholar, wrote an opinion piece for CNN in the aftermath of the horrendous mass murder in Norway by suspect Anders Breivik. 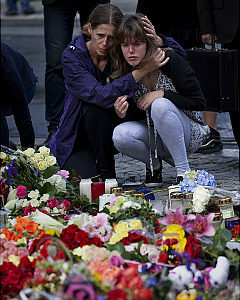 Breivik set off a bomb and then, disguised as a policeman, infiltrated a youth camp where leadership and politics are taught and opened fire, at this point claiming at least 76 deaths. 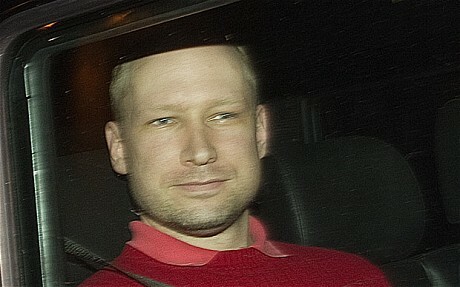 Breivik is white, Christian, and released a bizarre 1500 page manifesto in which he advocated a revolution in which the cultural dominance of Christianity might prevail over what he saw as an “Islamic-Marxist” alliance. He wanted to speak on television in his hearing to plead his case, still apparently seeing that his murders were somehow defensible as a desperate call to arms in a culture war. No one would defend what Breivik did. Glenn Beck, whose irrational rantings have gotten even stranger since being booted from Fox, did offer the most incredibly insensitive (or worse if he believes his own drivel) statement of all when he mulled that the camp itself seemed somehow sinister, like a Nazi Youth camp. Glenn, did you never go to civics? Events and summer leadership training happens in the USA all the time, and many of them quite patriotic. .
All of our texts have violent stories in them–Jews and Christians the book of Joshua, Islam has its parallels. Christians have often been fond of talking about “spiritual warfare” and the world hearing us doesn’t understand that we don’t mean “killing people.” The “weapons” of Christianity are faith, hope and love. The way of Jesus is one of non-violence, not killing. Have we not made this clear? Apparently not. So what does this have to do with “worldviews”? I’ve kept thinking about him writing that 1500 page abomination before doing this. His “worldview”. Having a Christian “Worldview” has become a bit fashionable in recent years among evangelical Christians. We talk of the importance of “examining one’s presuppositions” as though our own are clear and rational and pure and the rest of the world (the “lost”) are corrupt, compromised and sinful. For more than thirty years I have engaged in many discussions with fellow Christians about “worldviews” and hear many preachers and media personalities talk about the so-called “culture wars” with this language. “Constructing a Christian worldview” is a large enterprise. I believe in Jesus as the son of God. I am a Christ-follower. I encourage others to follow His way. Why would I react so negatively to all this “worldview” talk? Why WOULDN’T I join in the obsession of so many to construct a “Christian worldview”? Other than my almost automatic dislike of Christian trendiness itself, I would have to say that it’s the “rationality” of it that worries me. The boundless optimism of naive Christian warriors is astounding. They read a few books about the “Christian worldview,” and pretty quickly move to authoritativeness about “standing up” against this that or the other. It’s not that I don’t take the Christian view of things seriously–it’s that I do. First, my “view” begins with the Jesus of the New Testament. He engaged not in antiseptic schoolboy debates and parlor arguments based on straw men, but pushed deeper, down into human hearts. Second, rather than seeking some comprehensive, one size fits all “system” that appeals to some personalities (who almost always benefit from it–strange about that), like the Pharisees and Sadduccees of his day, Jesus invited his followers to a Way of surrender to new perspectives, ruthless self-questioning, and humble obedience to his teachings and love for one another. Third, the Christian “way” is not merely about rationality. It speaks to the irrational and subrational, too–to things we can’t know and don’t know. The Holy Spirit has to reveal truth to us, little by little, and so we are invited into this incredible humilty of following and living not from some “top down” system but from “bottom up” surrender. It’s not very surprising that the bin Ladens, Nazis, Holy Warriors, Klansmen, Inquisitionists, and Breiviks of the world manage to create a god in thier own political, cultural and racial image and then demand that everyone else bow to it. But it is not the God of Jesus. We cannot assume that the world knows these distinctions. We ourselves have profaned, ignored and compromised this vision of our Lord too much. We have explained away his call to peacefulness and created our own many systems. Prothero is right in that sense. So count me as one who says clearly, “This is not Christian, even if it claims to be.” The renunciation of violence as a way to resolve disputations, in a time when killing has become so efficient, seems more important than ever. Be clear–we follow a Savior who laid down His life for the world and refused to take up the sword to save it. Whatever we think of government, armies, war, executions and every other way of violence, let us at least acknowledge that the taking of life is profoundly serious and something that we accept, tolerate and ignore too often. We have been too comfortable rationalizing our own way of life and downplaying the difficult and serious things our own Founder said to us. I speak out to say, “Mr. Breivik in no way speaks for me as a Christian.” But further, I stand against every effort at a “Christian view of things” that can be snapped together like intellectual Lego bricks, a neat little house of explanation of my own making. Those of us who have anguished sincerely for decades to learn how to pray shake our heads. One does not “tell” God what needs to be done. This young man knows nothing of the ways of God. But we offer him too many voices that seem to say these very things–voices of anger, frustration, rage and cultural certainty. But no one seems to have taught him how to actually pray. So Christians, speak. And let’s beat our swords into plowshares and our spears into pruning hooks, as the Hebrew scriptures put it. And maybe while we’re at it let’s refashion those worldviews into calloused knees. Maybe if we spent the time we were using to argue our “worldviews” praying for our neighbors and for God to have mercy on us sinners we could find a better way. Posted on July 28, 2011, in Christianity, holocaust, Jesus, Norway massacre, Politics, Prayer, Theology and Life, violence, worldview and tagged Breivik, Christianity, fundamentalism, Jesus Christ, Mass Murders, Norway, worldview. Bookmark the permalink. 2 Comments. Good post. I also found it strange how the Right were quick to separate this man from his self-confessed worldview, even going so far as to label such links as liberal attacks of Christianity. The same group of people seem to have had no problem characterizing a whole third of the world based on the actions of 19 individuals in 2001. I do believe that ideas have consequences. Before, during, and after my time in Rwanda, I studied how political and cultural scapegoating and other propaganda were part of a deliberate strategy to get the majority of Rwandans (a nation that was considered to be 98% Christian at the time) to believe it was their God-ordained duty to hack their own neighbors to death. Instrumental in this strategy was the church of Rwanda, where at best local churches were silent about the discrimination and vitriol being taught on the airwaves and in public forums, and at worst local churches actually preached the same hatred and even helped coordinate the slaughter, all in the name of patriotism. Years later, when church leaders were asked why they participated, they claimed that they believed their actions were harmless until it was too late. I do not believe it is melodramatic to say that as a nation we are edging closer to some horrific event that will dwarf the violence we have already seen. Hearts are getting harder, financial insecurity is removing the “comfort barrier” that stops people from radicalizing, and hope of change seems to be fading away. I do believe that the only mechanism that can save us is the same one we have unknowingly relied on all along, and that is the grace of Jesus Christ. I just hope that the Church in America wakes to its responsibility to proclaim his peace. Very insightful thoughts, Michael. I went to your blog when I saw this. Some great stuff. The one about cool churches broke my heart. I used to be in a church like that in high school, and there was so much genuine zeal in its aspirations. And those of us in dull old churches keep struggling with the bridge building. But more and more, being obsessed with fashioning authentic lives seems important to me. Worldview issues actually are very important, and I think reflecting on it is very important. I hope I argue against superficial engagement and one that takes seriously the question of “the depths.” Paul Tillich once said of symbols that we treat them as though we can arbitrarily give them power. Nothing could be less so. They arise from unconscious and archetypal collective realities, so often “worldview” involves deconstructing in order to be more faithful in reconstructing, or something like that, from my point of view. Teaching someone to pray or to feed the poor or to repent is just as valid a part of building a worldview as writing manifestos. Maybe a lot more? I hope you are wrong about the cataclysm, but I share the uncertain feeling.